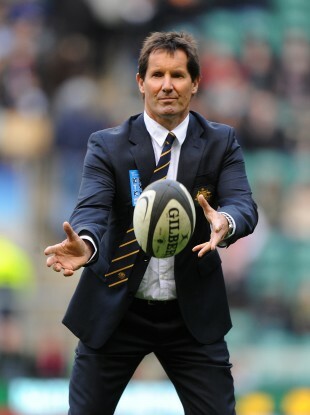 Robbie Deans, the former New Zealand international and current head coach of the Wallabies. It’s all his fault, apparently … except it isn’t. When Robbie ‘Dingo’ Deans announced that he’d crossed the Tasman to take over from John Connolly as head coach of the Wallabies back in December 2007, it was pretty enormous news in New Zealand. Graham Henry had recently taken the All Blacks to a shocking quarter-final loss against the French in RWC07 [the Kiwis’ earliest exit in RWC history] and many rugby fans expected him to be sacked. After all, he had taken his test players away from their Super Rugby teams for seven weeks of that tournament, and if you take a big gamble with public opinion like that – rugby fans like to see the best players playing, and while Kiwi fans are all about the All Blacks ahead of their provincial teams, it doesn’t mean they want to see their provincial teams shorn of their top players against Australian and South Africa outfits – you can lose big. He did, and people called for his head on a plate. Deans in happier times, celebrating a Crusaders’ championship. The Mole is pretty sure that Deans would have won a home World Cup if he had been coach of the All Blacks in 2011, especially when you consider the standard of competition: France were pretty crap throughout, South Africa were ancient, England predictable and Wales were impressive but lost every tight game they played. Obviously Graham Henry won the whole thing eventually, so you can say that it was the right choice to keep him on, but we’ll never know. It’s difficult to overstate Deans’ credentials for the job, especially given the momentum he had built and the timing of the review. As head coach of the Crusaders, he had taken the Canterbury-based outfit to no fewer than five Super Rugby titles [2000, 2002, 2005, 2006 and 2008]; immediately prior to that, he had acted as manager to a Wayne Smith-coached Crusaders team that won the 1998 and 1999 titles. In total, he was either manager or head coach for seven Super Rugby titles. Crucially, he was the architect behind the downfall of Auckland, who had dominated New Zealand rugby since the very early 1980s. Auckland had put together a remarkable 61-game streak defending the Ranfurly Shield between 1985 and 1993, and the professional franchise based in the region, the Auckland Blues, won the first two editions of Super Rugby in the pro era, the 1996 and 1997 Super 12 competitions. Deans first oversaw the toppling of the Auckland totem and then consolidated Canterbury’s place as the pre-eminent province in New Zealand rugby, taking the power away from the North Island for the first time in more than twenty years. I think it’s fair to say that more than a decade after his first championship, the Crusaders are still the dominant force in New Zealand rugby, even though Waikato are the reigning Super Rugby champions. So, when it was announced in early December 2007 that the NZRU had decided to retain Henry for a further two years, Deans must have felt personally insulted. Henry had built his coaching reputation with a strong Auckland side from 1992 to1997, winning four provincial championships in a row between 1993 and 1996 before taking the newly-professional Blues to back-to-back Super Rugby championships. He’d had his bite at the All Blacks job, and despite being the best team in the world, he didn’t get over the line at RWC07. 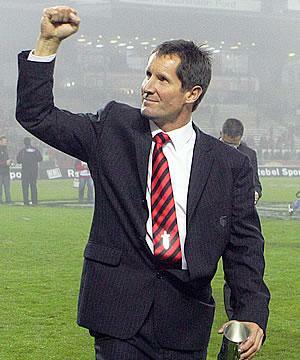 Deans had put in an even more impressive coaching stint at the Crusaders, and deserved a shot at the top job. He wasn’t given the opportunity, and the ARU sensed his dissatisfaction and swooped in to make him an offer he couldn’t refuse. Deans saw out his tenure with the Crusaders with yet another Super Rugby title , before taking the Wallaby reins in June of that year. He opened his account with a tight win over Ireland, before putting a lot of points over a pair of bizarrely selected French teams in the next two tests. He went further into the black with the Aussie rugby public by beating both South Africa and New Zealand in the Wallabies’ first two tests of the Tri-Nations – both of them at home – and oversaw a 27-15 win over the Boks in Durban, the Wallabies’ first win in the Republic since 2000. However, the Wobs were also on the end of some steep losses, notably a 53-8 in Johannesburg the week after the Durban win, when admittedly a number of important first-string players were out of action. Ewen MacKenzie’s Queensland Reds shocked the world [well, the rugby world] by winning the 2011 Super 15 title, and while a weak Australian selection were stunned by a decisive loss against Samoa in July 2011 in their sole summer friendly [the northern hemisphere test sides concentrating on their own preparations for RWC11], the Wobs had an easy intro to the Tri-Nations, playing a second string Springbok side in Sydney and running out to a 39-6 lead by the 55th minute before taking their foot off the gas and allowing the Boks to score a couple of consolation tries. While The Mole much preferred the original format Tri-Nations to the bloated six-game version [who were they kidding with those third games between two sides who’d already played each other home and away?] you’d have to be an Australian to believe that the Wallaby title of 2011 was as hard-fought or bore the same weight as the Kiwi win in 2010 or the South African win in 2009. The three sides were using the tournament as preparation for RWC11, and they went about it in different ways. The first South Africa team the Wallabies faced was composed pretty much entirely of second and third stringers, and the second one they faced in Durban was composed of the experienced players that Crazy Piet had kept out of the first two tests of the tournament for rehabilitation/conditioning purposes. They thus hadn’t played together as a team since November 2009 and were both short of match practice and out of puff after fifty minutes in their first test of the season. The Wobs came away with an unconvincing win in a poor match, but a win in South Africa over the Boks is nothing to be sniffed at. However, between those two Bok games the Wallabies had crossed the Tasman to take a 30-14 beating from a focused All Blacks side in Eden Park, in a game that truthfully the Australians were never really in; the All Blacks led 30-7 after 75 minutes, and a late try only made the scoreboard more acceptable for Aussie eyes. 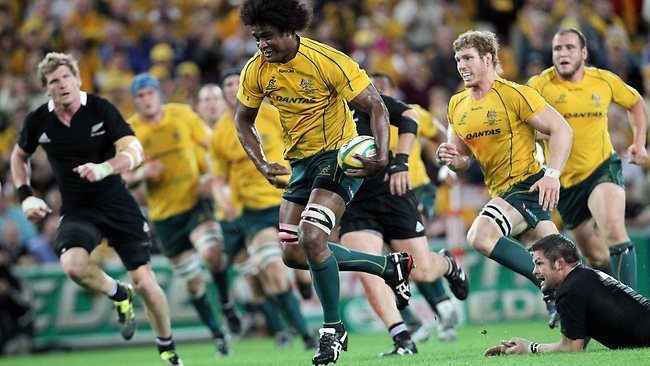 Radike Samo breaks away for the defining try of the 2011 Tri-Nations. If the All Blacks had been 100% focused on winning the Tri-Nations, they would have sent a stronger team to South Africa the previous week, not one that was missing McCaw, Carter, Thorn, Read, Nonu and Smith. The two teams would meet again in what would turn out to be the tournament decider in Brisbane. Graham Henry had sent over a weakened team to South Africa to bear the brunt of the Bok backlash from their Aussie loss in Durban, so it was two two-win teams going at each other for the win at the home of the Queensland Reds, in front of a crowd that had rediscovered its voice after watching their home team take a Super Rugby title for the first time in sixteen seasons. The game will be best remembered for Radike Samo’s wundertry, but to the cynic it was the only game of any value that the Wallabies won in that tournament, and for parts of the game it looked like the All Blacks’ thoughts were already on the forthcoming World Cup. Still, a Tri-Nations win is a Tri-Nations win, and it was the first time the Wallabies had won the tournament since 2001. They don’t draw pictures in the record books, they just write down the score. RWC11 is sufficiently recent not to have to go over it in an great detail; a Pocock-less Wobs were upset by Ireland in the group stages, and then in turn upset the Boks in the quarter-final with the aid of some über-dubious breakdown refereeing by Bryce Lawrence. They were put straight back into their box with an open-and-closed loss against eventual champions New Zealand in the semi-final, before inflicting Wales’ third defeat of the tournament in the third-place match to earn a bronze medal. Ireland bossed Australia at RWC11 and the Wobs couldn’t believe it. Their lack of firepower up front, and especially the shortage of forwards who have emerged from Super Rugby during Deans’ stint as Wallaby head coach, was always going to be a targeted weakness at RWC11. A month and a bit later in early December, an Australian team with six changes in the pack from the team that started against New Zealand in the World Cup semi-final [and without Kurtley Beale, Quade Cooper and Drew Mitchell in the backline] went to Wales for a grubby one-off test and came away with a handy 24-18 win against a pretty strong Welsh outfit. In the recent June 2012 three-match series, the Wallabies did what no northern hemisphere team were able to do this year, and beat Wales. And then they beat them again. And then they beat them for a third time in three weeks, and a fifth time overall in Wales’ 2011-12 season. And they did this without captain James Horwill, outhalf Quade Cooper, fullback Kurtley Beale [largely, although he did appear in the dead rubber], winger Drew Mitchell and hot-tempered larrikin James O’Connor. Unfortunately for Deans, the Aussie rugby public don’t respect any northern hemisphere teams bar the White Orcs of Ongultehra, so whitewashing the Grand Slam champions didn’t get him the brownie points that it should have. Nor did beating the Argentines – or even the South Africans – in recent weeks. It seems to The Mole that the only thing that’ll appease the Aussie rugby unionistas is beating the All Blacks … and frankly speaking, the Blacks are simply in a different league to everybody else in rugby at the moment. A full-strength Aussie team can compete with them, but an injury-stricken, out of form and out of sorts bunch? Not a chance. Neither Eddie Jones [2001-05] or John Connolly [2005-07] won a Tri-Nations tournament – even a half-assed one – but nor did they receive the same level of opprobrium as Deans has from Wallaby fans. That’s probably because they’re both Australians. Deans is the first non-Australian head coach in Wallaby history, and the knives have been out for him in some circles from the first loss. Not only has he had to deal with the mild xenophobia of the mouthy Aussie press, he’s had to deal with a rugby structure that is a very different – and likely very inferior – beast to the New Zealand system which he grew up in and to which he made a significant contribution. We’ll look at this in Part 2. This entry was posted in Opinion, Tri Nations and tagged All Blacks, Australia, Choke Choke Choke, Crusaders, Dingo Deans, Graham Henry, New Zealand, Robbie Deans, RWC07, Super Rugby, Ted, Tri-Nations, Wallabies by dementedmole. Bookmark the permalink. Bit of selective work here – ignoring the home loss to England in 2010, for example, not to mention away losses to Wales, Scotland and a draw with Ireland. Further, the Deans era has been notorious for his side having multiple technical shortcomings. As good as the wins in South Africa were during the 2010 3N the Australian defensive effort was simply horrible. The scrum had improved in 2008/09, but then melted thereafter. No improvement has ever been maintained and thus there has simply been no consistency from the Wallabies, which I think is the issue rather than the losses to the All Blacks. Or at least that’s what I’ve been getting off the Roar website. Good timing with this Mole because the wheels on the wallabies cart are really starting to buckle at the moment. Ignoring the on field performances, the lid has been lifted on the level of discontent off the pitch over the past couple of days. Quade Cooper made headlines here with comments on twitter on Sunday about the ‘toxic environment’ within the Wallabies camp and was critical of the style of play being adopted. While I accept that Deans has some blood on his hands and the situation has renewed questions of his man management, I think a large part of the issue is that the guys that he’s tried to build a team around have failed to repay the faith he has consistently shown in them. When he took the job he made the call to clear the decks of the old brigade (Smith, Waugh, Giteau et al) with a view to giving the emerging youth a chance to shine. My read is that, while the talent of the so called ‘three amigos’ (Beale, O’Connor, Copper) is irrefutable, so too is the fact that the surrounding hype and their ordination as world beating leaders of the wallabies happened far too quickly and went straight to their heads. They have consistently been involved in off field incidents (ranging from tame – O’Connors sleep in to miss the world cup announcement, to the criminal – Coopers burgulary charge and Beale’s recent charge of assualting a bouncer in Brisbane.) The latest headlines were for a 2am car crash in Brisbane last Saturday involving Cooper, Beale and Ioane before the latter two were to fly to SA the next morning. Their behaviour and the emergence of a ‘team within a team’ has apparently shattered the long cultivated togetherness within the wallabies dressingroom. The fact that Deans had put the old guard out to stud (perhaps prematurely) coupled with the incredible run of injuries to the emerging leaders (Elsom’s body breaking down and the ‘captains curse’ has deprived him of the services of Horwill, Pocock and now Genia) has come back to haunt him. This now sees Nathan Sharpe, who had planned to be spending his days fishing on the Western Australian coast at this stage (and ironically was one of those cast aside when Deans got the gig) being patched together to lead the team through the end of the current campaign. It will be interesting to see how it plays out but the odds of Cooper defecting to the NRL to join $onny Bull have shortened considerably. Great comments, Davus. We are dealing with the injuries and discipline in Part 3, and [bar the Brisbane car crash, which is news to me] everything else you’ve mentioned comes up. It’s more or less finished already, or else we wouldn’t bother posting it … you’ve pretty much nailed every single part of it!